When you’re walking 7,000 miles the shoes on your feet make a big difference. In December I appealed to Rogue Priest readers for their advice on footwear. The choice is which theory to side with: conventional advice that highly engineered, thickly padded athletic shoes are best, or the controversial claim that such padding only weakens the foot and increases likelihood of injury. There’s no firm scientific data to give either side a knockout victory, so personal experience is all I have to go on. After listening carefully to all the great advice you guys gave me, I decided to buy some shoes and run some experiments. I have no means to conduct a large-scale scientific test. I can however try out two different pairs of shoes under controlled conditions to see how my own body reacts to each. Road Course: 6.5 mile loop on asphalt roads, mostly level, some slight hills. Walking. Off-Road Course: Fixed course of unknown length with a mix of asphalt roads, soft foot trails and complete off-roading in thick forest. Includes 300 foot off-road hill ascent and descent. Walking. Jogging Course: Approximate 3/4 mile course on level asphalt road. Jogging. The plan is to complete each course twice under virtually identical conditions except for the difference in shoes. I’ll put several off-days of just light walking in between each session, so that the aftermath of one won’t affect the other. I especially want to pay attention to how my ankle feels afterward and the following day. So far I’ve completed the Road Course. In the No-Padding Corner: Steve Madden canvas shoes. These shoes feature flat, thin soles with essentially no padding. The construction is sturdy with suede trim. While by no means flimsy, I can’t imagine a thinner shoe without going to Vibrams. In the Athletic Shoe Corner: Converse Chuck Taylor All-Stars. These shoes have nearly an inch of padding under the heel, arch support, and a sculpted insole that arcs down toward a thinner front. This is the classic shape of the athletic shoes that barefoot runners claim will mess up your foot. Both pairs of shoes were bought second-hand but never used. Both fit well and are comfortable to wear casually. In general I’ve been very undecided about the footwear controversy. I usually make decisions like this based on science. In its absence I’m agnostic. But over the past sixth months of adventuring I’ve been wearing very thin shoes. There’s no planning behind this: I traveled light and wore what was available. With time I became accustomed to having very little padding. When I first put on my Chuck Taylor All Stars it felt awkward but comfortable. I wasn’t used to having such thick, heavy things on my feet, but I did notice how soft my footfalls were. It took a little while to realize that the awkwardness was not just caused by their size, but by a difference in angle of how my foot lands on the ground. Padded heels have an effect. I started taking casual short walks in my All Stars to get used to them. I want to go in as unbiased as possible. It didn’t take long. I forced myself to remember that they may surprise me and outperform the Steve Maddens. I did my exercise and stretching routine earlier in the day. After I returned I had about a one hour “cool off” period of light walking on soft surfaces or standing on my feet. Later that night, when I stood up after eating dinner, I noticed my ankle had stiffened up. It was nothing like I got after walking up a mountain, but it was more than I would like to see from such a short walk. The following morning there was a little residual stiffness, but no noticeable increase in inflammation. The walk was easy and even more comfortable. I believe the slight increase in pace, if significant at all, was from being a bit chilly at the beginning of the walk. I did the same exercise and stretching routine earlier in the day, and a similar one hour cool-down period after the walk. I went at the same time of day as the other test. I didn’t notice soreness in the balls of my feet during the walk. I did however notice that it felt more awkward to walk along the sides of the road. The slight crowning of the road, and the angle of the gravel shoulder, had been nothing in the Steve Maddens but seemed a little irritating in these shoes. That night after dinner I experienced stiffness again, but it seemed less pronounced this time. The following morning brought at least as much residual stiffness however. Again, there was no increase in inflammation. I was very surprised with the results of the first test. The padded shoes really did seem to correlate with less stiffness later, which indicates less wear on my ankle. But the stiffness the following morning worries me, and I could never have imagined the problem with walking on slanted surfaces if I hadn’t experienced it firsthand. Do you think the off-road results will be similar, or will there be another surprise? This is fascinating! I can’t wait to see the results. I’ll be extra interested in the jog results, as jogging generally involves a different gait and a whole different set of stresses than walking. Make sure to pay attention to your knees, hips and back on the jog test, and not just your ankle. I’m glad you’re giving your own body a chance to see what it likes! were the converse a high-top shoe? if so, this could be the cause for the ankle stiffness. 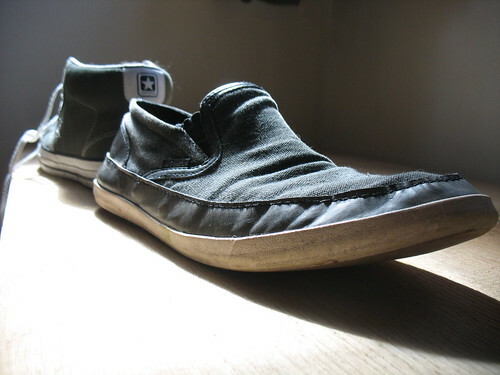 I wore a pair of low top Vans skateboarding shoes when i was at University, walking between four and six miles a day up and down hills and stairs. Not only were they well padded (though by the end of the third year that was pretty much crushed down) they were very comfortable, never gave me any stiffness, and lasted through four years of heavy use. not to mention the thick treads, which i would imagine would last through a lot of walking. Nope, these Converses are low-top. It’s hard to see in the picture but I’ll get a better shot for the post about the next test. I seem to remember my old Vans in middle school being some of the best shoes I ever had. I’m going to have to look into that. Thank you Lucius! Great that you’re doing some testing. Here’s some anecdotal evidence (i.e. not scientifically robust, but may be useful.) I used to wear a very minimal shoe by Steve Madden. I loved them and they lasted a good 2-3 years. I was even putting duct tape on them to cover the holes I’d worn into the soles because I liked them so much and didn’t want to get rid of them. But I remember the days that I worked a lot (12-14hrs) and did a lot of walking and standing — my feet would be sore at the end of the day. I have a pair Vibram 5-fingers because I was sold on the idea our feet are best shaped for walking, without all the bulky padded soles of modern shoes. I wear them for fun now. There is simply not enough time to have passed for us to have evolved to walk on hard surfaces like cement and asphalt. So I opt to wear the typical tennis shoes most of time. If I lived in the outdoors and walked on grass, I’d say minimal soles or no soles would be best. Just my thoughts on the topic! Thanks for this. More and more I believe that the problem is not padding as such, but the shape of the padding in athletic shoes with arch support and a jacked up heel. Padding in itself only makes the ground softer, like walking on grass instead of concrete. But sculpted padding changes the way the foot moves across the ground which is where it becomes unnatural. This is just a theory. I’m quite heavy, have flat feet, and used to backpack with a 50 pound pack. I found that for me, a high-top shoe with a pronounced arch support and some padding (stopping short of being too stiff or mushy-feeling) was best for that. I never buy walking shoes that don’t have enough flexibility to hike on uneven surfaces. The outsides of the heels of my shoes wear out quickly, and I find that it’s important to replace the soles (or the shoes) as soon as that becomes pronounced. I’m guessing that everyone has their own foot issues when it comes to walking long distances, and I think that you’re doing the right thing in testing out different types of shoes before you set out. Thanks for sharing your experience Deeleigh. I do agree everyone has a unique body. I’m sure it’s good to know what feels best for me personally. But this is also where I stop trusting my body. I might find through these experiments, that you did, that the padded shoes are “better” – but what am I basing that on? Because they are more comfortable, or I’m less sore? If the padding also raises my probability of having a serious foot injury – something my personal experience can never tell me – is it worth it to be more comfortable? Likewise if the reverse is true. If I choose thin-soled shoes because I like to feel the ground and feel “natural,” and it leads to a serious injury, where does that put me? Honestly I’m a bit nervous about basing what’s essentially a medical decision on how it “feels” to me, but I guess I have no other data source. Honestly? With the kind of walking you’re planning on doing, wearing the same shoes all the time might give you some kind of repetitive strain injury. I’d make provision to switch them out regularly; maybe even walk barefoot occasionally.